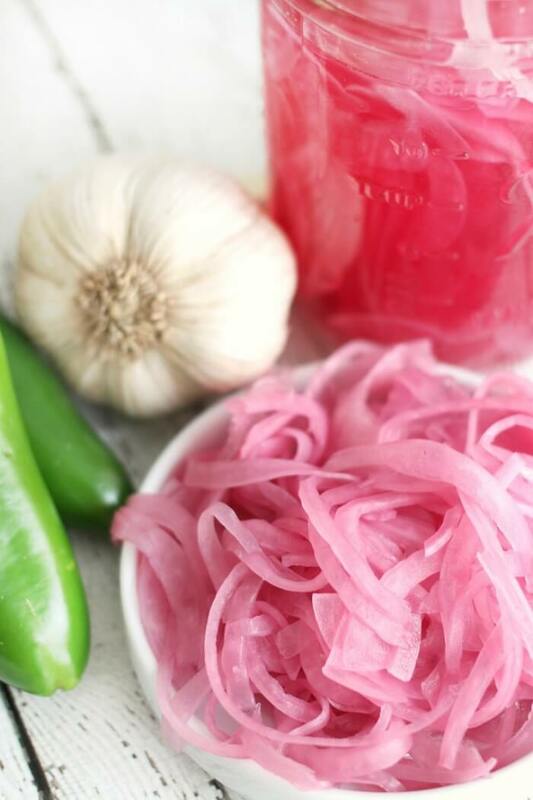 Pickled onions are simple to make and are a delicious addition to everything from sandwiches, to pork roasts, and even hot dogs! We always keep a jar of pickled onions in the refrigerator. They’re the perfect tangy, sweet, crunchy topping for so many foods. 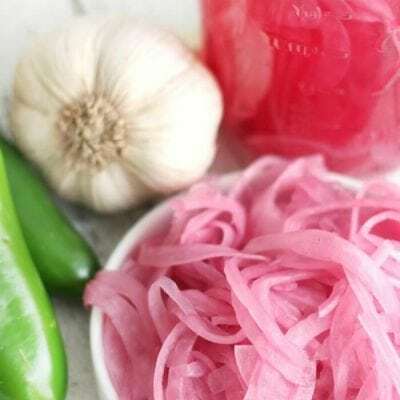 I added a big pile of pickled onions to the pulled pork recipe we made last week and it was delicious – also great on pork tacos! How do I make crunchy pickled onions? 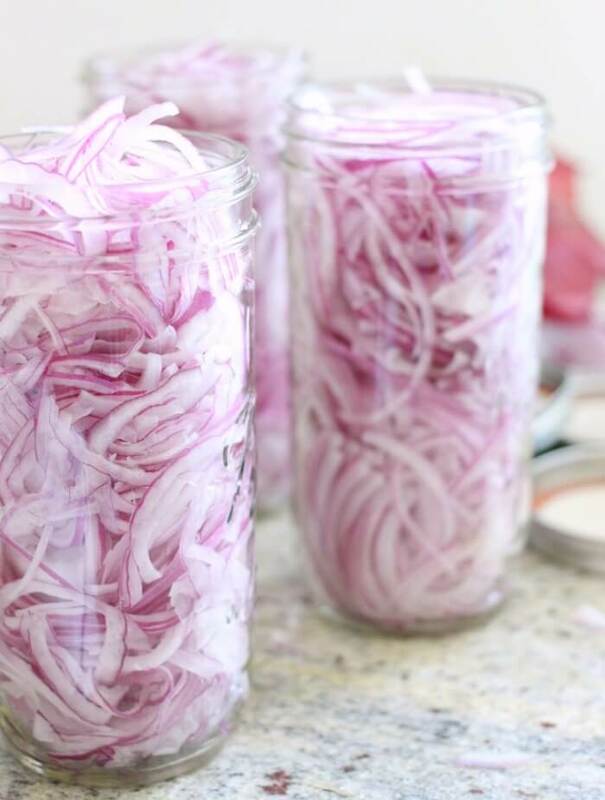 Pickled onions will always add a little crunch to your food, but if you want super crunchy pickled red onions, you’ll want to slice them thicker. We use a mandoline to get perfect even slices every time. I tend to make mine paper thin, but it’s purely personal preference. thicker sliced onions will definitely add more crunch. You could also do a thick dice of the onion rather than slices to create a different texture. What makes pickled onions pink? 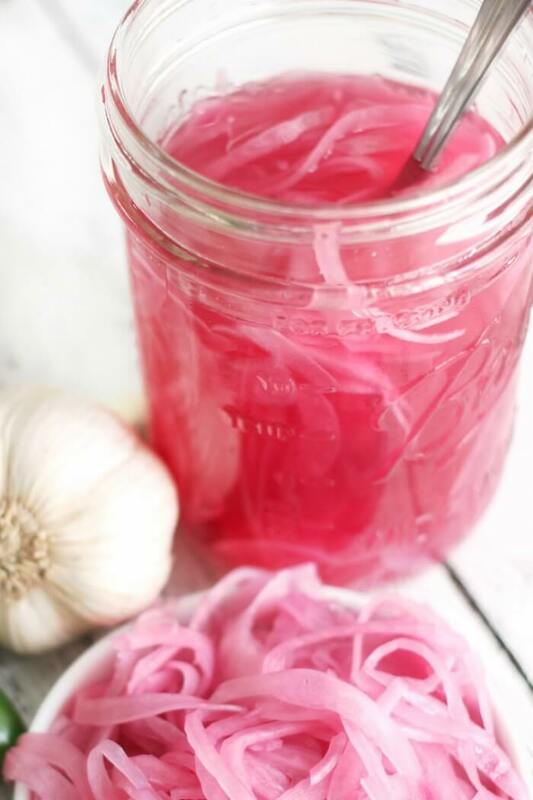 Pickled onions are pink because red onions have a lot of pigment in the skin. And let’s be honest, that pigment is more of a pinkish purple than red. 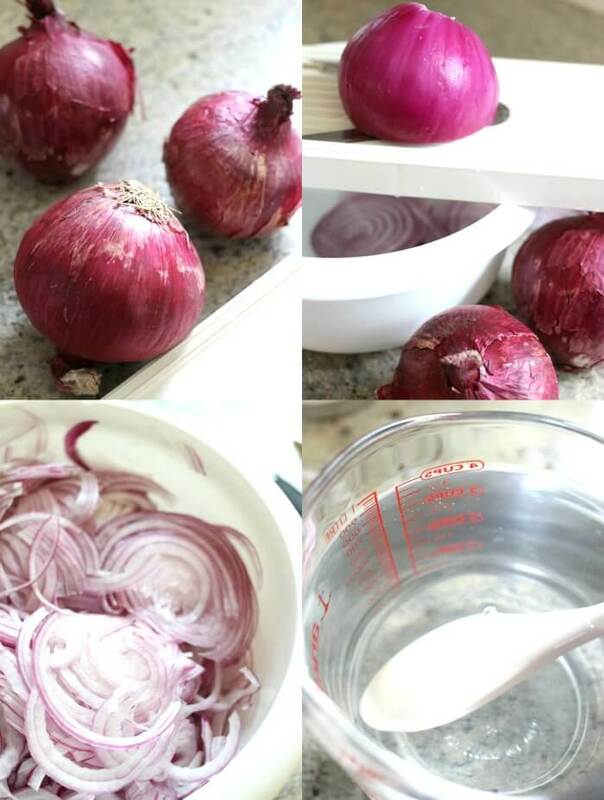 When the onions are steeped in vinegar, that pigment seeps out into the liquid and dyes the white part of the onion pink! What vinegar do you use to make pickled onions? We use plain white vinegar to make our pickled onions. It provide a very clean and pure flavor that is totally delicious. If you wanted to play with the flavors, try using apple cider vinegar, or rice wine vinegar, even a balsamic vinegar! Each of these will create a slightly different flavor profile for your pickled onions. How do you pickle onions? To make sweet pickled onions we use a combination of white vinegar, salt, and sugar. 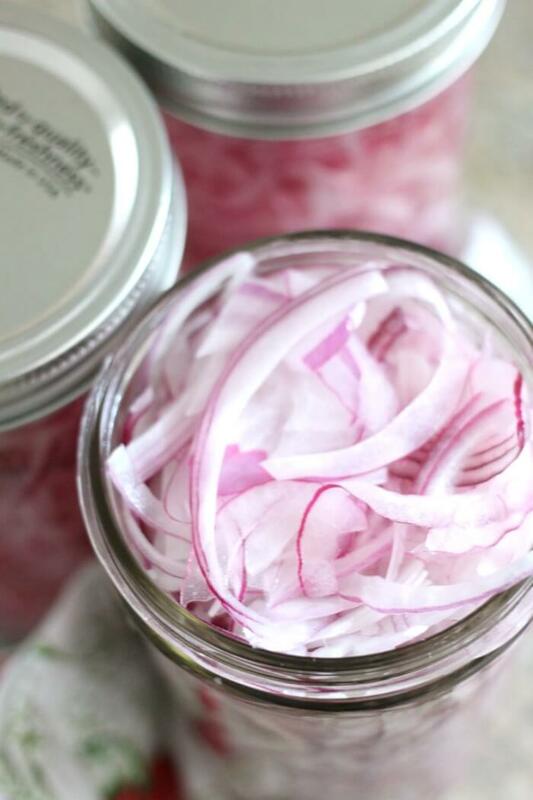 If you want your pickled red onions sweeter or less sweet, just adjust the level of sugar. It’s important to taste the brine (with a clean spoon!) so you get exactly what you want. Slice the onions, add them to a clean jar, then add the brine. Refrigerate at least two days before using. What is in pickled onions? White vinegar, salt, and sugar are the traditional base for pickled onions. You can change the flavors by using more or less of the ingredients, and also by trying different types of vinegars. For example, a rice wine vinegar base would be perfect for a more Asian flavor in your Korean Pork Tacos! How do I make spicy pickled onions? To make spicy pickled onions, add a few sliced of fresh jalapeno to your jar! I like to add them to the bottom of the jar since the goal is spicy pickled onions as opposed to pickled jalapenos. This way you’re adding flavor but not accidentally grabbing a jalapeno. That said, if you want to make pickled jalapenos, those are delicious too! Use your Pickled Onions on these! Slow Cooker Pulled Pork – Alllll the pickled onions on pork! What is it about pork and onions? Pork onions and apples, specifically – and this pork recipe is made with apple juice, so it’s just asking for some pickled onions on top! Fish Tacos – These fish tacos are just begging for some crunchy pickled onions. We make our fish on a sheet pan with garlic and butter. Simple but so delicious. Bacon Pineapple Pork Tacos – I know, I know… more tacos, and more pork! But if you’ve never added bacon or pineapple to your pork tacos, stop! Do it now, and then message us about how much you loved them. Because you so will! Cilantro Garlic Sauce – Speaking of tacos. Pretty much anything you can put pickled onions on, you can also top with this crazy yummy cilantro garlic sauce. We usually have a jar of cilantro garlic sauce sitting right next to the pickled onions in our fridge. Mango Pineapple Salsa – Much like the cilantro garlic sauce, this mango salsa goes with most the same things as our pickled onions. How about coconut chicken hoagie with cilantro garlic sauce, mango salsa, and pickled red onions! V-blade Mandoline Slicer – We love this mandoline slicer for making perfectly even pieces of onion for your pickled onions. Use the thick slicer for crunchier pickled onions and thinner for more traditional pickled onions. Ball Quart Wide Mouth Canning Jars – These are the size jars we typically use. Our pickled onions are refrigerator pickled onions, not water bathed, so it’s just for pretty storage purposes. Wide Mouth Plastic Storage Lids – Since these aren’t water bath canned, I prefer to use these plastic storage lids. They’re one piece and screw on really easily. You can also watch us make these Pickled Onions on Youtube! Make sure to tune in for all our live cooking shows! Combine vinegar, water, sugar and salt in a microwave safe glass or bowl and microwave for 1 - 2 minutes, until salt and sugar dissolve when stirred. Pour brine over onions, cover and refrigerate at least two days. When the onions have turned an even shade of pinkish purple, they're ready. We use a mandoline to slice our onions thin and evenly. You can see it here: MANDOLINE SLICER. Thank you these look beautiful One question how long do they keep in the refrigerator? Not a problem for you since you eat them on everything, but I cook for one. I guess I could cut the recipe down if they don't keep for a month? There isl a head of garlic in your photos, but it’s not mentioned in the recipe. Am I missing something? I’m a big fan of pickling. I usually do carrots. Going for onions next time! RICURA, LAS HARE HOY, GRACIAS POR LA RECETA. Do you have to use sugar ? Can I can these like traditional pickles and keep on shelf?